Molly’s Game is the true story of the rise, fall and redemption of Molly Bloom, who by the age of 26 was dubbed the “Poker Princess” for organizing high-stakes poker games in L.A. and New York for movie stars, athletes, and rich business men. This entertaining film marks the directorial debut for Aaron Sorkin, the Oscar-winning screenwriter of a number of hit movies (Social Network, Moneyball) who wrote this screenplay as well. The film begins describing how Molly (Jessica Chastain, Miss Sloane, 2016) ended up in her unique position in the underground gambling world. Oddly enough, her story begins on the mountain slopes training as a downhill skier in Colorado. Her father (Kevin Costner, Hidden Figures, 2016) always pushed her to excel and it paid off as she is ranked third in the U.S. in slalom skiing with plans to attend a top law school after the Olympics. Those plans are derailed during her time trial as she snags a branch while attempting a jump and significantly re-injures a childhood injury. Molly’s wipeout abruptly ends her skiing career. Instead of going to law school as expected, she puts it on hold and heads to L.A. to come up with a new plan, this time, against her father’s wishes. With little money, Molly crashes on a former teammate’s couch and finds work serving drinks at a trendy club and lands a job as an office assistant for one of the club’s regulars. Though her new boss Dean (Jeremy Strong, Detroit, 2017) is verbally abusive and her salary is less than the tips she makes, Molly keeps the office job to avoid telling her parents she serves bottles of liquor for a living. Eventually, her boss involves her in his weekly poker game at the famed Viper Lounge. With a $10,000 buy-in, famous actors, athletes, and business men give Molly generous hosting tips, which end up surpassing what she makes at her other jobs. As the tips roll in, Dean decides she needs to either give him a portion of her cut or be fired. Molly has other plans. She ends up taking his players from under him and sets up her own game in a swanky hotel. With the backing of a famous actor, who is called Player X (Michael Cera, The Lego Batman Movie, 2017), her game grows in stature as the buy-in increases. Eventually, she moves her set-up out east to NYC where her games draw men from Wall Street and even the Russian mafia, which only brings more danger to her life. In addition to Molly’s background story, the movie occasionally cuts to Molly in the present day where she faces federal criminal charges for being involved in a criminal conspiracy that stems from some of the players in her game. 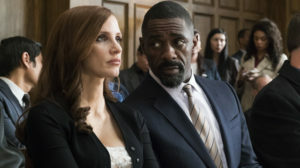 Although Molly hasn’t run a poker game in two years, she cannot escape her reputation as the “Poker Princess.” Despite her precarious position due to her inside information on many powerful people, she eventually convinces a prominent attorney (Idris Elba, Thor: Ragnarok, 2017) to take her case and they mount her defense. Molly’s Game is a very entertaining film. Since Sorkin served as screenwriter, it has the fast-pacing and quick, almost too clever dialogue that are trademarks of his scripts. Through Chastain’s narration, the film does a great job of describing the world of high-stakes, underground poker even to those who are entirely unfamiliar with poker. Chastain is a natural in the role and continues to excel with characters who are brilliant and no-nonsense as she did in last year’s Miss Sloane. Elba, Molly’s defense attorney, is also great in a supporting capacity, especially as he sparred with his opposing counsel in court. Elba’s British accent does slip through at times, however. Costner, as Molly’s father, continues to do solid work in smaller roles and has some moving scenes. Not every casting choice works in the film though as Michael Cera really doesn’t fit the character of a famous hotshot actor, but thankfully it doesn’t deter much from the story. Also, despite the story moving at a quick pace, it does run too long. Bottom Line: With the compelling story, Sorkin’s gift for dialogue and Chastain’s performance, audiences should take the gamble on this movie.